Gray skies and cold wind got you down? Crochet some sunshine! The Rainbow Happy Fun Pouch will come to your rescue! The Rainbow Happy Fun Pouch is insanely cheerful. But in a good way! It’s a great stash buster, and it works up fast. I wanted a simple pattern with which to try out the Sharp Hook but that could be done without the Sharp Hook too. 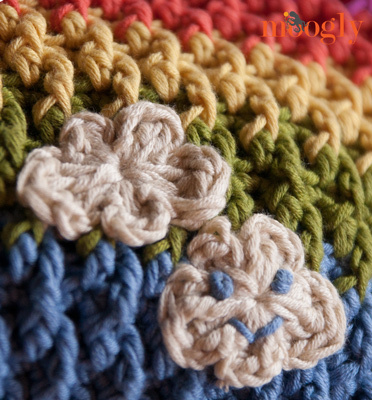 I utilized a stitch pattern I used before, so there’s already a video tutorial for the stitches if you need help there. 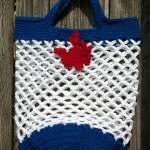 I also managed to use some leftover yarn from the Moroccan Market Tote – stashbuster! You can use any weight yarn you have, just use a hook one size smaller than that recommended on the label. As written, the pouch is 6.5″ tall and 9.5″ wide, but the great thing about pouches is they’re useful at any size! For the appliques I used a free pattern from Fiber Flux: One Round Cloud. They took hardly any yarn at all! And I gave one a little smiley face with some scrap yarn. As you do when making a Rainbow Happy Fun Pouch. Round 9-12: With Color B, repeat Rounds 5-8. Round 13-16: With Color C, repeat Rounds 5-8. Round 17-20: With Color D, repeat Rounds 5-8. Round 21-24: With Color E, repeat Rounds 5-8. Add more stripes in pattern for a taller bag if desired. Round 26: Sl st in each st around. Break yarn and seamless join. Measure the length of zipper needed. If the zipper is too long, sew a new stopper with matching thread, by sewing around the zipper repeatedly so it cannot open. Working into Round 26, attach the zipper. 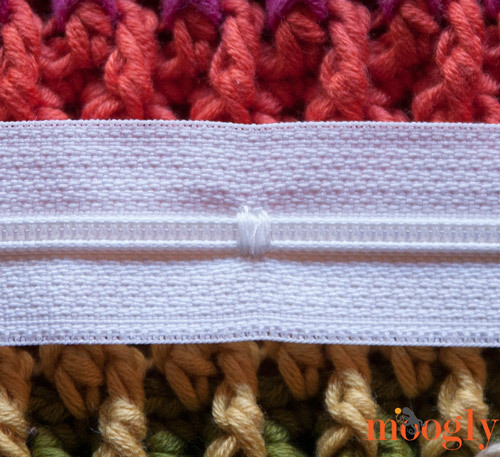 If you’re using a needle and thread, sew it on with the back stitch (tutorial HERE). 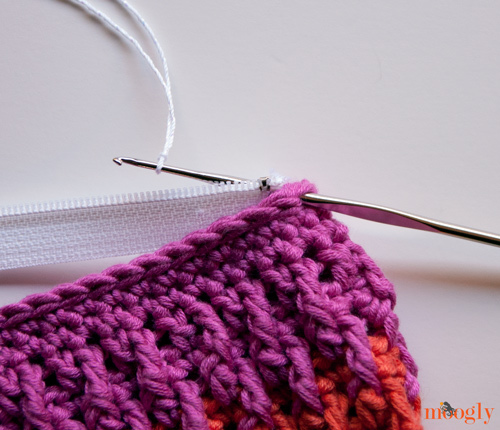 If you are using the Sharp Hook and crochet thread, use the Surface Crochet method (tutorial HERE). And that’s all there is to it! 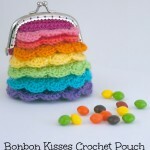 The Rainbow Happy Fun Pouch is a quick and easy pattern that’s great for using up odd balls of yarn. Make it in one color or as many as you like – and then fill it with something fun! Written pattern copyright Tamara Kelly 2013 – share this pattern via links only please! You can use the green Print Friendly button below to print a copy for personal use. Seller’s policy is detailed on the About page. Get Moogly on your favorite social media sites: Facebook, Twitter, G+, Pinterest and Tumblr, and sign up for the Newsletter so you don’t miss a thing! Did you line the pouch or just add the zipper? If I line it. Do you recommend any special fabric? Any fabric should work! Fleece is nice because you don’t have to worry about raveling. But other than that, it’s up to you! Thank you. Will try the fleece. Also, can you attach material plus zipper onto bag at same time? For that many layers I’d recommend sewing a quick edge around the fleece, and crocheting into that rather than the fleece itself – unless you an punch holes in the fleece! 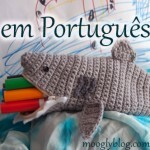 I love this stitch pattern I am using it to make a sleeping bag for my grandkids dolls. Can’t wait to use it for making a blanket. Thank you so much for sharing it. To this date, I have never heard of a “sharp hook”, and thought this might be an opportunity to at least find out more about it and possible enter to win said hook. For whatever reason, the link fore this contest and any reference to it is not loading. The clutch-like pouch does seem interesting enough and will help reduce the “clutter” of left-over yarn that keeps building up. Thank you for the pattern. Thanks Tamara – i’m going to make this, haven’t tried this stitch yet, so will be fun to give it a go!!! This looks gorgeous – and I have quite a few ends of balls to use up. Wouldn’t mind winning one of the Sharp crochet hooks either! Thank you for this fun rainbow of the day! Love this and shared it like crazy! 🙂 But then again I love Moogly! 😀 Thank you so much Pauline!! sorry for the interference!..but its my RED SIGNAL..LOL!!! Hi Tamara! I’m in love with this pattern and working on one now! Is it possible to get the final measurements on the one you made? Mine looks big to me! Hmm I’m doing the stitch wrong. Mine is that big and I’m only on the second color. I knew it looked wrong! 😀 No worries! It was easy to miss! I would like to make this pattern, but what is a fptrc stitch. Never saw this abbreviation before. Hi Eileen! Fptrc is front post treble crochet. 🙂 There’s a video tutorial for the stitch pattern linked in the bullet points with the hooks and yarn. Tamara, your genius is showing! Every time I come to Moogly I learn something new, creative and usable. It will be awhile before I can start the clutch, but I will FOR SURE use your Surface Crochet method many times over. (I used your link to the tutorial.) Thank you so much for your generosity in sharing your designs and your genius. I am trying to print out then pattern and when I do there are advertisements printed over the instructions, What am I doing wrong, I love this little purse, trying to make them for a cruise. It’s very nice I think I want to make one. 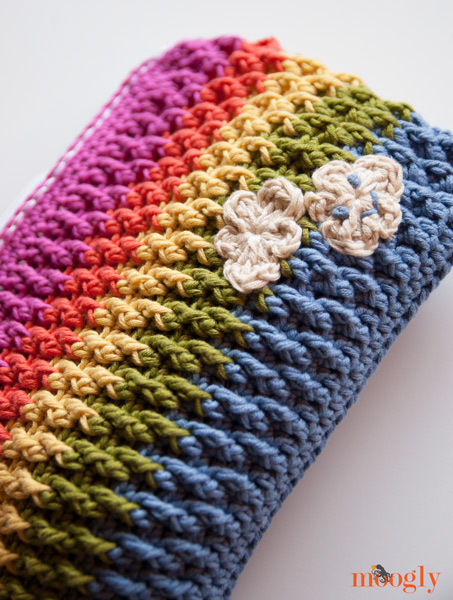 Do you show how to do row 2.. I’m kind of stuck when you say to crochet in the side stitch. 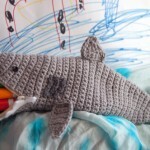 Hi Rosalee – it’s not crochet in the side stitch, but crochet in the side of the stitch. If you look at the row, there’s the tops of the stitches, the bottoms of the stitches, and the sides on the left and right. So you crochet across the top, and then you spin the work clockwise and crochet into the side of the stitch you last worked into, then spin again and work across the bottoms, then spin one more time and work in the side of the first stitch you worked into. Does that help? I’m a bit confused here myself. Hi Colleen! It’s essentially the same as if you were making a border around a (tiny!) blanket – you turn and work all the way around. Does that help? I can add a video to the list too, but I hope maybe the blanket description helps? In row three, do you make the first stitch in the same stitch as the chain 2? Some patterns vary o this. Also the chains do not count as stitches throughout the pattern, right? Hi Janet! Futurgirl has a great lining tutorial that I’d recommend! what are meaning “st” “ch” “hdc” ” and other abbreviations used in text ?? I made the morroccan market tote from your pattern and love it! I also love the bamboo cotton yarn! I saw this and just had to try it. I’m not quite finished yet but I absolutely love the pattern and texture of this little bag. I’m toying with the idea of creating a little flap closure instead of a zipper. I’ve also added some daisy motifs for my daughter. I love clutch purses, but I didn’t like the size of the pouch, so I cut the starting chain and number of pattern repeats in half to make a beautiful clutch with a cloud in the bottom left corner. Love this pouch. Thanks very much for the pattern. Made two. both were appreciated very much. Credit goes to you . thanks again. When I saw this picture I thought it was a headband and wanted to make it for my granddaughters. It’s such a beautiful stitch. Any idea how long you would make it for a headband? Such a cute pouch! I absolutely loved this textured pattern. It is so unique! I want to make a hat for my daughter ( regular adult size) with this pattern. Can you please tell me how to do the increase using this pattern. First I thought I’ll do simple double crochet increase on top for first 5-6 rows, and then use this pattern. But I’ll really appreciate if you can suggest me a way to use this stitch through out. 😀 Thank you so much Karla! I have searched for days for an etrepreneurs day project for my daughter, nothing i found suited her. She had to make 30 products to sell made out of recycling. My left over wool we see as recycling and she absolutely loved your pencil case. Thank you. 😀 I’m so glad to hear it! You’re very welcome! thank you for this beautiful lovely pattern. i am medical student and i love to crochat i use it as stress reliever. and small projects are my favorite because usually i am kind of busy. thank you and i wish if i can show you my final result for this bag. Thank you Wala! 🙂 I would love to see a photo! You can email it to me at tamarakelly at mooglyblog.com, or post it to the Moogly Facebook page! For round 8, when you say “using the Next Color” does that mean that you change colors after round 7 and round 8 is a row of sc in the new color, or does that happen at the end of round 8? Thank you! Greetings! 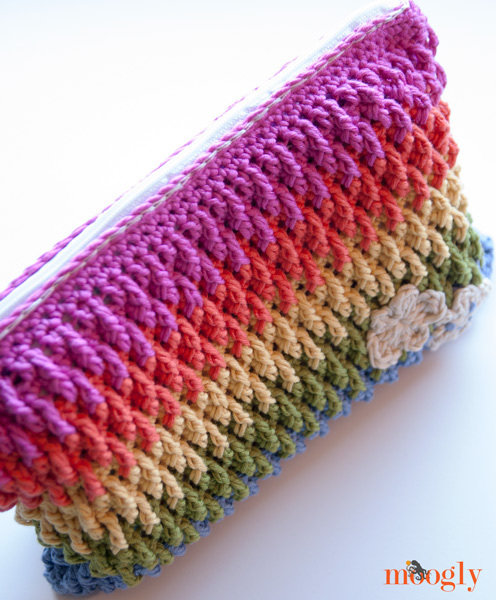 I Love the Stitches for the colorful rainbow pouch and would Love to make a rectangle scarf! How would I do that without working it in the round?